- President Franklin D. Roosevelt on December 8, 1941. On December 7, 1941, Japan, through its Imperial Navy, launched a sneak attack on the United States at Pearl Harbor in the Hawaiian Islands. 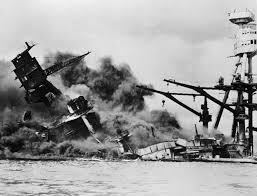 Nineteen ships were damaged, 4 battle ships were sunk (the USS Arizona never was recovered), 188 aircraft were destroyed, and 2,471 Americans were killed. 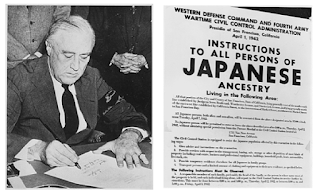 The United States, whether it wanted to be or not, was now at war, with Japan. Two months later, Executive Order 9066 was issued –Americans of Japanese decent (approximately 120,000 people) were evacuated from the West Coast of the United States into Interment Camps inland from the Pacific Ocean. "Yellow Peril” was the fear. The Japs were not just coming – they were all ready here. America feared the traitors within. History since then tells us “evacuated” was really “arrested” and “Internment” was Imprisonment without due process. In 1988, President Ronald Reagan set the record straight – this was a shameful action and time in American history. Apologies were officially stated and financial reparations made. Truth, like history, has a murky past. Is this chapter in American history whitewashed in political activism and political correctness? Admittedly, the infringement of civil liberties is abhorrent. However, was the fear legitimate? After all, no Japanese (American) was ever convicted of war crimes or espionage, so the story goes. And, we proudly recognize the actions of the 442 Infantry Regiment – the nearly all-Japanese unit in Europe that became the most decorated unit in World War II – anecdotal evidence to “prove” the injustice dealt to Japanese Americans. Is there perhaps an alternative story? 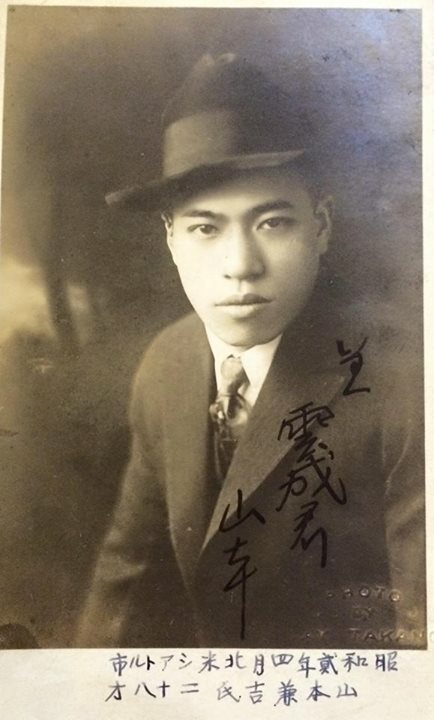 Kanekichi Yamamoto was born in Japan in 1901, the second son of Sutejiro Yamamoto. By birthright, his older brother, Ichiro, inherited all rights, responsibilities, and material accumulation from many generations of the Yamamoto family, per tradition. To Kanekichi, as "second son" – nothing. This did not bother Kanekichi. "Why waste feelings and effort over things one does not control?" he reasoned pragmatically. His life was his own – unbounded by the past or family obligation. He would control his destiny. But what would that be? He intuitively knew his destiny -- Japan's destiny -- lived outside of Japan and Asia -- in a land called America. In the early 20th Century, Japan was transforming from a poor agrarian country into an industrial, political, and military power. In 1905, Japan won a surprising victory over Russia, forcing Russia out of Manchuria and setting the stage for greater military and political expansion. Japan, not just his family, provided the backdrop for Yamamoto's ascent to greatness. He was a proud, loyal, but pragmatic nationalist. Japan had set it sights -- China, Asian, the World. Yamamoto was obligated to his country and emperor. This was his destiny. Yamamoto immigrated to the United States in 1918. Upon arrival, he ventured to the Toyo Club, a gambling house in Seattle's Chinatown, at the instructions of a mysterious family friend in Japan – Mitsuru Toyama. It was his introduction to a life of organized crime. Years pass. Yamamoto had risen to the head of the Toyo Club. Yamamoto – known as the “Yellow Al Capone” -- controlled interests from Alaska to Baja California. Beyond gambling, the Toyo Club was an illicit empire of drugs, prostitution, and small business shakedowns. Canneries and fishing were legitimate operations that provided cover for illegal activities -- laundering money, eliminating difficult people, and, especially important, secretly bringing Japanese military attaché in and out the United States. Yamamoto had close ties with the Japanese Imperial Navy. He imported spies that gathered important information on the American water, power, and military infrastructure. Explosives and weaponry, in preparation for an attack, were covertly brought into the United States. This was probably well known by the US government but largely out of sight to the general population. Ill-gotten gains from the Toyo Club were used to support Japanese Nationalism. With the help of Toyama (now the head of the Black Dragon Society), Yamamoto funded ultra-nationalist political candidates. After Nationalists won their elections, Japan invaded Manchuria and signed an alliance with Germany. Japan had proverbially "crossed the Rubicon." America saw the threat of Japan and the shifting balance of world power. Japan knew its conflict with the United States was unavoidable. On December 7, 1941, Japan launched a successful sneak attack on the United States at Pearl Harbor in the Hawaiian Islands. The United States, whether it wanted to be or not, was now at war with Japan.